I asked a friend to be part of an experiment which involved him poking himself with a needle most of the morning. And he agreed. We are both fat adapted (me for 15 months and him for more than 6 months). We both started fasted from the previous night (no breakfast for myself or my friend). We both ingested 50 g of Whey Protein (IsoPure Zero Carb Protein Powder) at the same time and measured our blood sugar responses over the course of the same morning. I am a Type 2 Diabetic who has their Blood Sugar “under control” via diet and am no longer on meds. I am 57-years old and do some exercise (CrossFit) five times a week for the past two months. My friend is a Tri-athlete in his mid-30’s. He’s not a Diabetic and runs frequently. His fasted (starting) Blood Sugar number was higher than mine (Dave Feldman refers to fasting blood sugars in lean athletes like my friend). We’ve compared numbers before and noted this same thing. We did not use the same meter since we were looking for relative differences not absolute values. 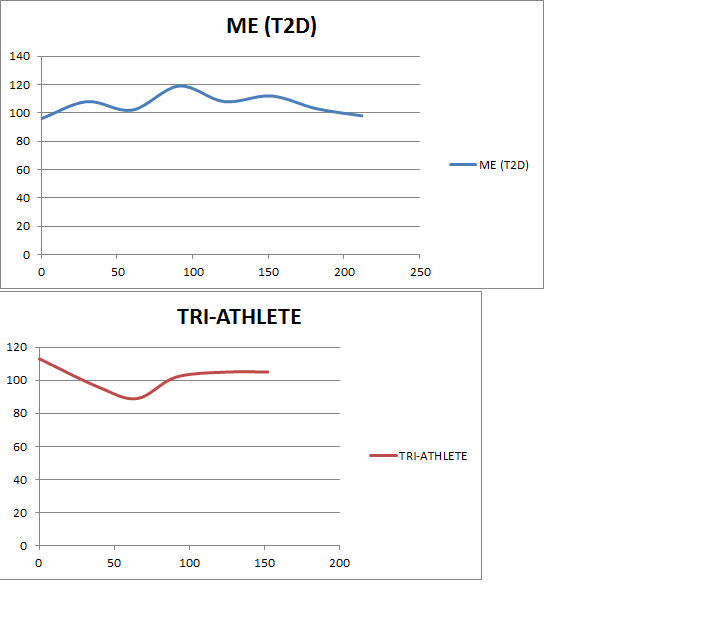 After ingesting Protein, the Tri-athlete’s blood sugar went down. My blood sugar (the Type 2 Diabetic) went up. His Blood Sugar returned to normal much more quickly than mine (less than 2 hours. Mine took over three hours to return to normal. I am not sure if his Blood Sugar went down due to him not having Insulin Resistance. If his Insulin went up in response to the Protein it could have driven his Blood Sugar down. Since I still have some degree of Insulin Resistance my Blood Sugar doesn’t go down nearly as well. Insulin favors oxidative decarboxylation of pyruvate and, therefore, also indirectly tends to diminish gluconeogenesis. Previous Previous post: Are you Insulin Resistant? Next Next post: What if the History of Diabetes Went Wrong?